For Fedrigoni Plus, a collection of fine UK-held papers, MuirMcNeil were invited to design an A1 folding poster as part of a series of limited edition prints curated by TM Studio. The series theme is ‘addition, expansion and augmentation’. Our response, printed in two metallics + silver foil blocking on Sirio Ultra Black, uses Fibonacci numbers as content and is typeset in TwoLine Hard B from the MMcN TwoPlus type system. Originally trained as an architect, Pablo Gimenez-Zapiola works with moving image and data projection techniques to explore relationships between language and its context in the environment. Several of his recent projects have made excellent use of the precise calibration of various type systems by MuirMcNeil in huge projections of words, literary texts and poems in a wide range of locations. Bisect is a monospaced geometric type system produced by MuirMcNeil in collaboration with Natasha Lucas who began working on the design for the typeface when studying at the London College of Communication. Bisect has been cut in three versions. These are designed to register precisely with one another in layers, allowing users to exploit the playful visual exchange between the horizontal and vertical character segments from which the Bisect letterforms are constructed. Our variable data cover design for Eye 94 received two further accolades last week – a D&AD pencil and Gold at the Society of Publication Designers 53rd Annual Awards in New York. Designed by Tim Hutchinson in collaboration with MuirMcNeil, THD Sentient is an all-capitals monolinear type family cut in four weights. It was originally created in a single weight for the exhibition ‘Beyond 2001: New Horizons’, a celebration of the 10th anniversary of the Stanley Kubrick archive at the London College of Communication which opened in January 2018. THD Sentient’s characters are based on the forms of numerals used to display telemetric data on the screen of HAL 9000, the intelligent computer that controls the systems of the Discovery One spacecraft in Kubrick’s ‘2001: A Space Odyssey’. 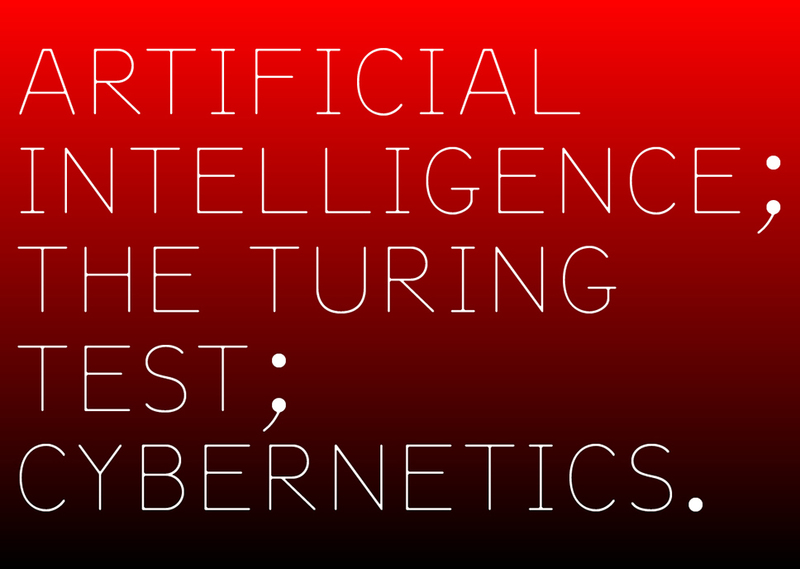 THD Sentient is available from MuirMcNeil in OpenType for Macintosh. 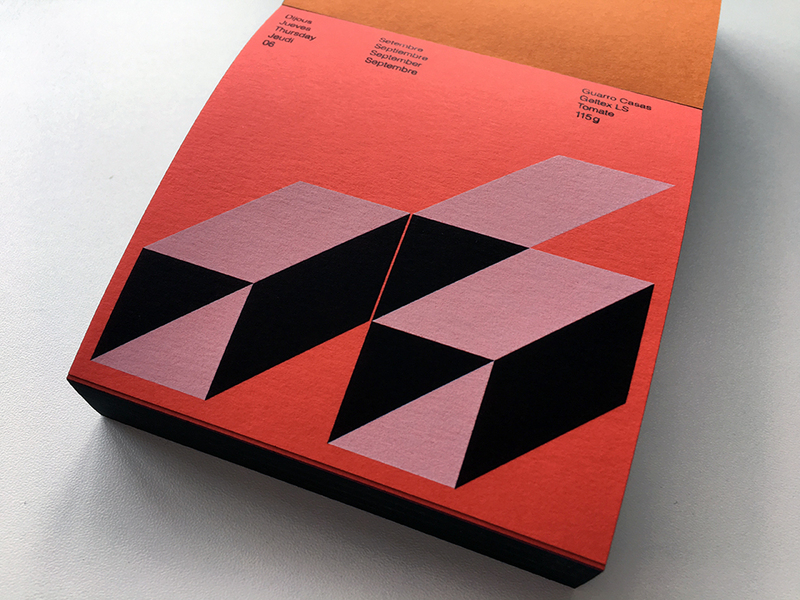 MuirMcNeil’s Panopticon type system has been featured in a 2018 desk calendar for a paper manufacturer by Wladimir Marnich of Marnich Associates, Barcelona. Marnich has been showcasing MuirMcneil typefaces on calendars promoting Guarro Casas papers since 2015. The 2018 edition uses Panopticon’s precise multilayering features to generate 365 individual settings printed in black and white on a range of coloured papers. Collidescape is the fifth installation work in an ongoing improvisation with the vowels A-E-I-O-U designed by Catherine Griffiths. The serial works explore material, spatial, cultural and contextual terms; the abstract construction of the letter shapes (line, curve, circle); and the speech sounds that these elicit. 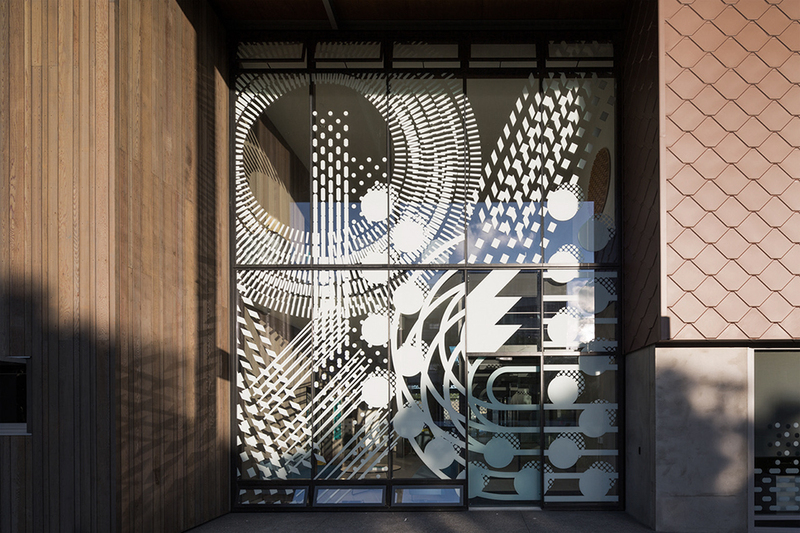 This composition, in white ceramic ink, applied digitally to a seven metre high grid of glazing at the entrance of Te Kei, a new building designed by Athfield Architects for Ara Institute of Canterbury, Christchurch, New Zealand, which opened in 2017. 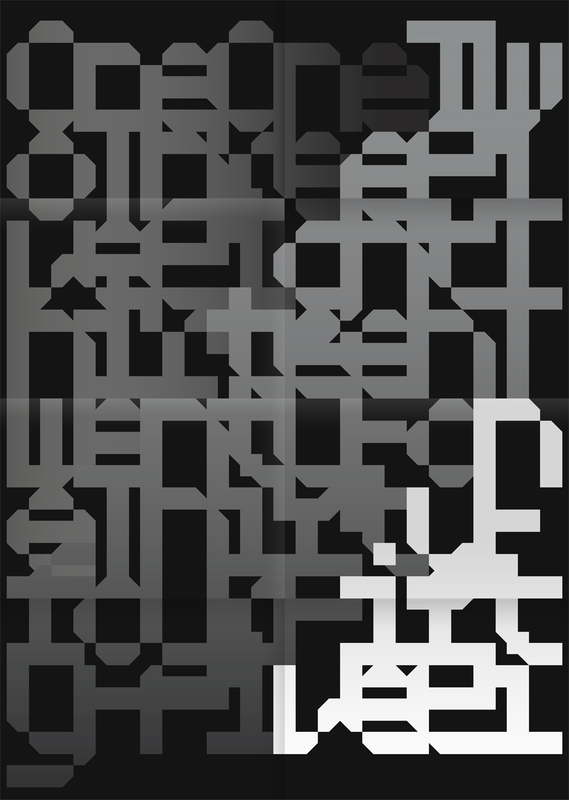 Typefaces from MuirMcNeil (TwoPoint and Panopticon), the computer’s default dash and slash lines, and danger tape pattern, make reference to other works in the series. 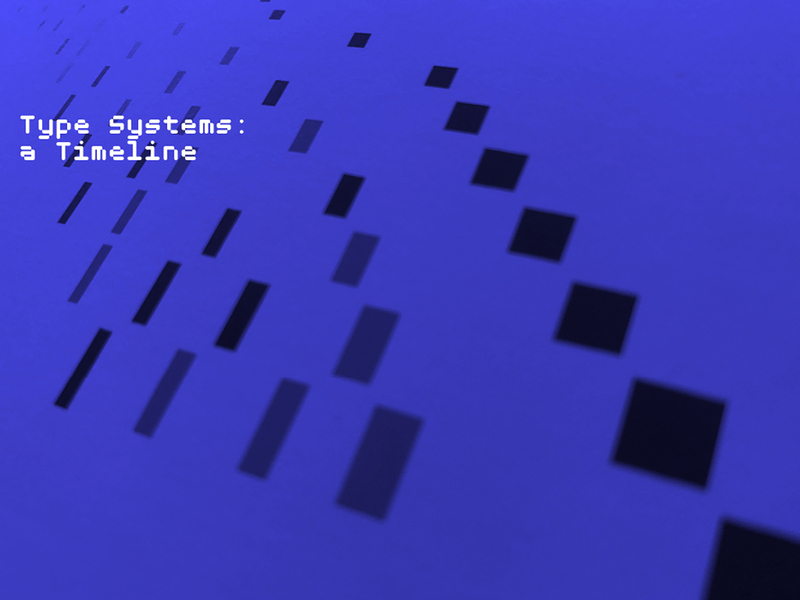 The underlying (and invisible) grid system is marked out in TwoPoint. 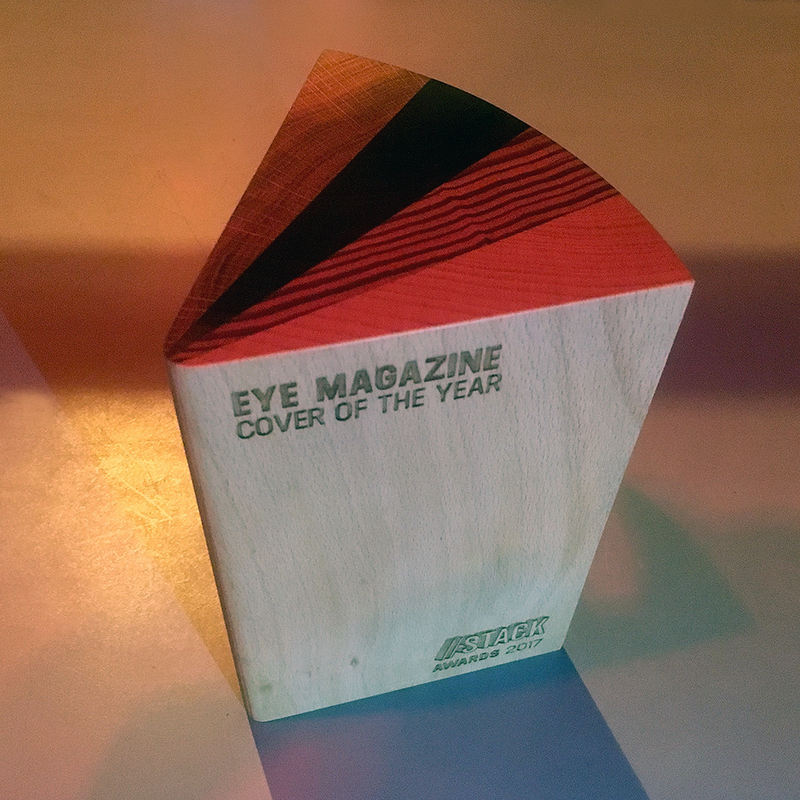 Eye Magazine won ‘Cover of the Year’ for 2017 at the Stack Awards, held at the Queen of Hoxton in London on 20 November. 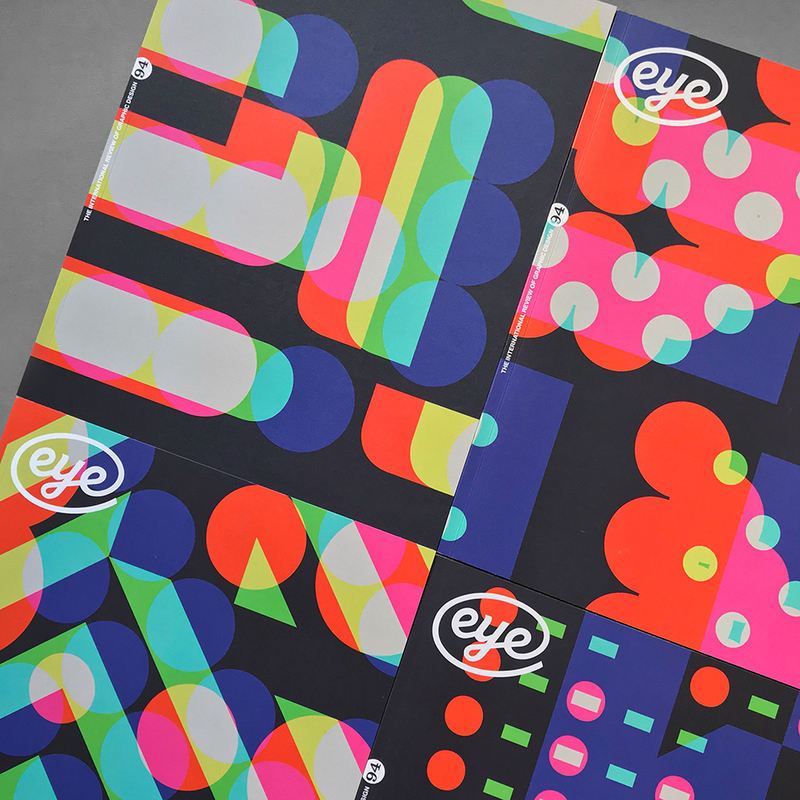 Eye’s innovative approach to generating 8000 unique covers for issue 94 clearly resonated with the judges for this category, Steven Heller and Jaap Biemans. Their reflections on the potential for variable data printing in the independent magazine sector are included in Madeleine Morley’s feature on AIGA’s Eye on Design blog. 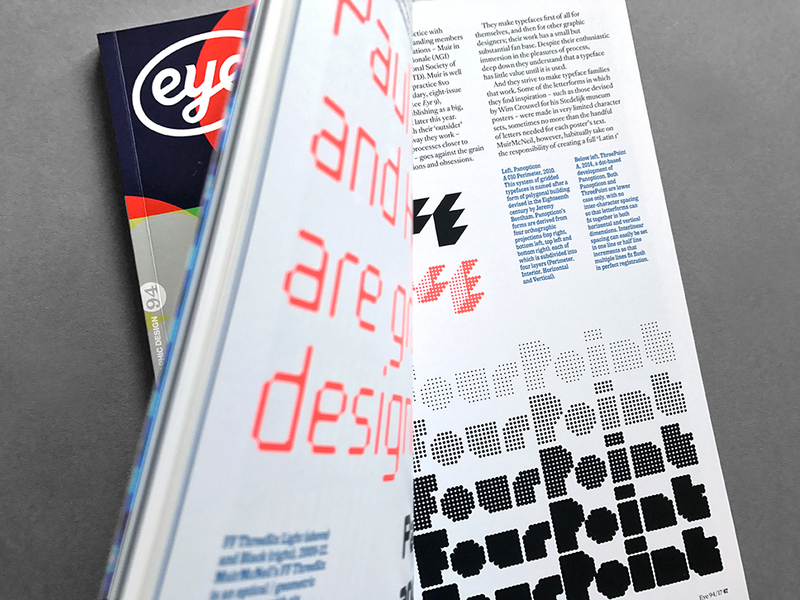 Eye 94, a ‘Type Special’ features a series of articles under the heading ‘Mightier than the pen: systems of type’ covering ‘parametric, geometric and constructed fonts’. In ’Pleasure in the process’, Eye’s editor, John L. Walters, considers MuirMcNeil’s approach to designing constructed typefaces ‘through mathematics, systems and experimentation, pushing hard at the boundaries of alphabetic form’. For Eye Magazine’s Type Tuesday on 5 September 2017 at The St Bride Institute, we gave a talk on our work within the historical context of systems approaches to type design and presented the story of the Eye 94 cover development. The event was concluded with a panel discussion chaired by John L. Walters (Editor, Eye) where we were joined by Simon Esterson (Art director, Eye) and Richard Owers of Pureprint (the printers of the 8000 variable data covers for Eye 94), in which we learnt, among other things, that the HP Indigo 10000 digital press is not a printer that can be sat on a kitchen table.